A Yawl is a two masted boat with a small aft mast ("mizzenmast") stepped far aft. The mizzenmast is aft of the rudder post and the boom usually overhangs the stern. The small mizzensail The sail set on the mast aft of the mainmast makes it easy to trim the steering when sailing single-handed. Main cabin set well aft with a pale green roof. Cutter Having two or more jibs rigged with short bowsprit A spar entending forward from the bow, typically used to anchor a forestay. Originally named Edlu, Orion won the Newport Bermuda race in 1934, and served as a patrol boat vs. German U-Boats in WW2. After the war she made her way to California, then Washington, undergoing extensive renovations in 2010. A high-aspect mainsail the sail right behind the mainmast, usually the largest means a larger gap between mainsail and mizzensail The sail set on the mast aft of the mainmast. White Bermuda-Rigged having a triangular mainsail Yawl. As shown in the picture, she occasionally flies a mizzen staysail A sail attached to a stay (instead of a mast) in the gap ahead of the mizzenmast The smaller mast aft of the mainmast. Built for the Four Winds Camp and named after a former camp director, Carlyn Stark. She is strip plank constructed with laminated frames and a plywood deck. Joshua is an historical replica of the Spray, the first vessel to be solo-circumnavigated around the world 1895-1898 by Captain Joshua Slocum. She was launched in San Francisco Bay in 1982. White hull with green bottompaintpaint below the waterline, usually to discourage weeds, barnacles, and decay and red bootstripea decorative horizontal stripe along the waterline. Wooden cabin with white top. Built for a Fuller Brush magnate, and originally named Eroica. Later owned by physicist (he was a protoge of Enrico Fermi), aerospace inventor and yacht racer Gabriel Gianninni, who sailed her to Italy, then relocated her via the Panama Canal to San Diego CA. She was renamed Pacifica and extensively overhauled. 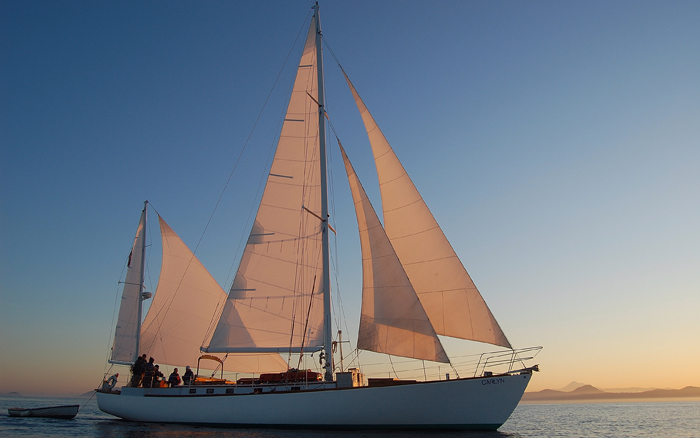 She has a fine racing record and was one of the first ocean racers to use an aluminum mast. White hull an cabin, dark blue cabin roof. Heavy frames, fir on oak. Based in Eagle Harbor and extensively cruised.